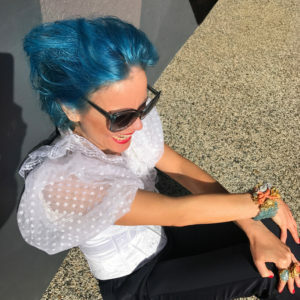 The Lady in Blu – Fashion – Pushes less consumption of new cloth through making restyling, repeating, reusing clothing attractive and socially accepted. Trend forecaster – the Lady in Blu – fashionista – inspirator – traveler – internationally well known for her unique, years ahead, vision on the future – level – visualizes today in order to understand the secrets of the future – translates future trends into strategy’s and innovations on product and company level – visualizes today in order to understand the secrets of the future – multi disciplinair – that what seems impossible is possible – innovator- designer – lived and traveled for 3 years with her kids on a sailing boat – founder trend forecasting studio Future-Touch – founder 3D print accessory label ToucheToday – founder The Lady in Blu. While building a healthy trend forecasting company I constantly search for opportunities to combine my qualities with future opportunities and needs of the society.